WASHINGTON, DC – A group of Republican lawmakers, veterans, and experts are calling on President Donald Trump to intervene in Iraq to stop a State Department policy that is harming a U.S. ally and allowing Iranian influence to grow. “This has to get above the State Department. I don’t think President Trump knows what’s going on here,” Marine veteran Rep. Duncan Hunter (R-CA) said this week at a press conference organized by Rep. Ron DeSantis (R-FL). “I don’t think he’s seen this picture of his tank as Commander in Chief with a Hezbollah flag on it,” he said, gesturing to one of the poster-sized photos he brought with him of Iranian-backed Shia militias using U.S.-funded equipment in Iraq. Iraqi forces and Iranian-backed militias have invaded and taken over areas within Iraqi Kurdistan and threatening more military force if they do not willingly give up areas under their control. The Iraqi Kurdistan Regional Government (KRG), a longtime U.S. ally who helped defeat the Islamic State in Iraq, governs the large Kurdish ethnic minority who live in the semi-autonomous region of Kurdistan in northern Iraq. Last month, the KRG held a non-binding referendum on Kurdish statehood, prompting Baghdad to send its elite counterterrorism forces, backed by Shia militias and armed with U.S.-provided tanks and weapons, to seize infrastructure in Kirkuk under Kurdish control. The seizure happened without much bloodshed after Baghdad made a deal with local Kurdish officials, but Baghdad is threatening to seize other areas by force, and Kurdish forces, known as the Peshmerga, are vowing to fight back. Helping to orchestrate Baghdad’s takeover of Kurdish areas are Shia militias known collectively as the Popular Mobilization Forces (PMF/PMU), including some who reportedly take their orders from Iranian Revolutionary Guard Corps Commander Qasem Soleimani. The U.S.’s position is not to take sides and urge both parties to talk, but lawmakers warn that unless the Trump administration does something, Iran will continue to grow its influence inside Iran to the detriment of U.S. allies in the region. 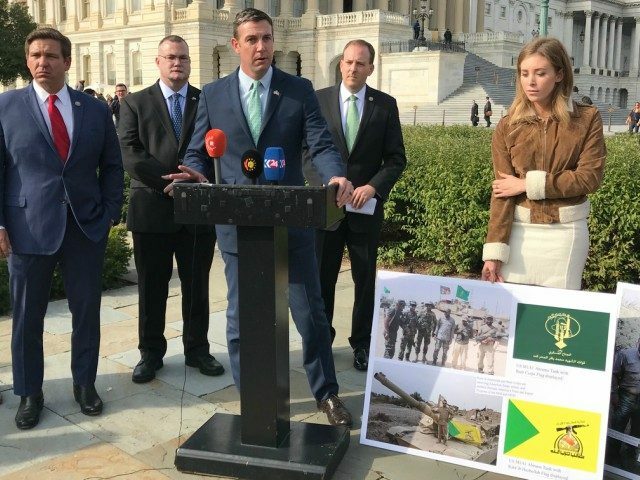 “The United States should be standing with our Kurdish allies, particularly at this hour of threat that they’re facing from Iranian-backed forces over in Iraq,” said DeSantis, an Iraq War Army veteran. If the Kurds are pushed back, Iran continues to dominate Iraq, and they can dominate the Sunni Arabs in Western Iraq, you’re going to have a land bridge from Iran all the way into Syria, right on Israel’s doorstep, that is going to be an absolute disaster for our security interests and for our allies’ security interests. “The kicker is that they are launching attacks against the Kurds or preparing to do so with American weapons. We cannot let this happen,” he said. But Hunter and others put blame squarely on the State Department, which they say is allowing Iran to run roughshod over Baghdad because they do not want to upset Iran. Sebastian Gorka, former deputy assistant to Trump, said that when he joined the administration, he learned that the same Obama-era officials were running policy in Iraq. “One of the greatest negative legacies that we inherited in the White House when I came onboard was the absolutely outrageously utopian and unrealistic policy with regards to Iran. Iran is a bad actor, across the whole region from Yemen, to Iraq to Syria,” he said at the press conference. Hunter pointed the finger squarely at Brett McGurk, who is the U.S.’s envoy to the region on the fight against ISIS. The Obama administration appointed him to that position, and before that, he served in the Obama administration as deputy assistant secretary of state for Iraq and Iran in the Bureau of Near Eastern Affairs. McGurk was originally a George W. Bush appointee and one of the chief architects of the Iraq surge. But Hunter said McGurk was also a “big supporter” of the Iran nuclear deal, known officially as the Joint Comprehensive Plan of Action. “Our president slams Iran every day. He decertified the plan of action, yet the State Department guy in charge is the one that invented the plan of action that the president just decertified. He needs to go. Mattis needs to take a hard look at this, and the president needs to see this. This should be elevated out of this one-person’s hands in the State Department so he can see what a travesty this is, and it’s caused by us,” Hunter said. “This was caused by the U.S. State Department, and it’s time to take it out of their hand, or at least elevate it to where the president or the secretary of defense has a straight-up say in this,” he said.